I was, even then, slightly dismissive of the notion that the internet could ever replace the printed object, as the relative experience of the two is incomparable. It now seems that the proliferation of digital technologies has pushed designers to almost overemphasise the materiality of books – by producing exquisite designs with sublime production values and clever binding – acutely aware of their tactile potential as objects. The web is no longer considered the mortal enemy of the book. 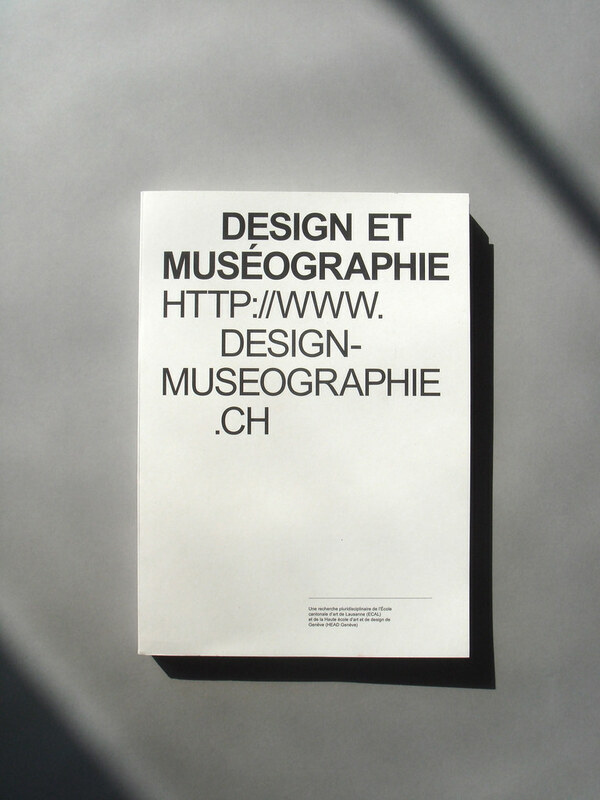 Indeed, the publication of the Design et Museographie research programme run by l’École cantonale d’art de Lausanne in Switzerland is distributed via the department’s own micro site: http://www.design-museographie.ch. A perfect example of how the internet and the world of printed matter can live symbiotically. 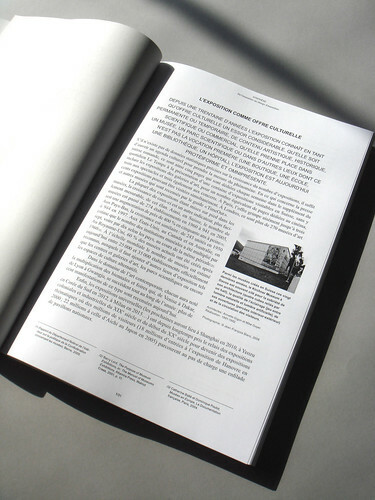 The visitor to the site can download and print pertinent sections, or even the whole book. I was lucky enough to receive one of a limited run of 50 printed and bound by the college. I received the full collection of interviews, essays and pictorial PDFs (designed by Nicole Udry and Audrey Devantay), which had been laser-printed and bound together. 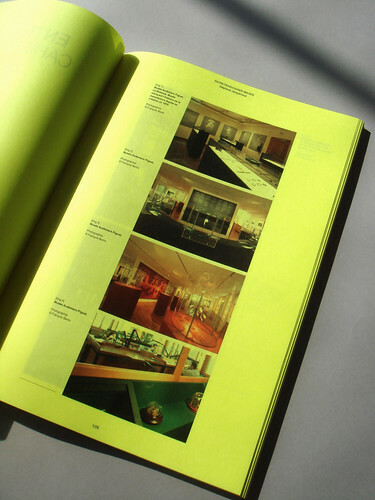 The paper stocks are bog-standard print-bureau: rough-as-hell copier paper for the text; natural white for section introductions; eye-bleeding fluorescents in pink, yellow and green for the colour image sections; Swiss-bound using a black book tape and a natural white board cover. I was immediately bowled over by the acid image sections, which are like powered-up versions of the pastel office paper used by college administration departments the world over. 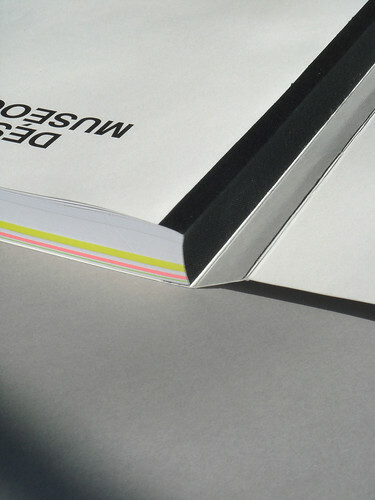 The structure is unconventional, as it does not use regular folio numbering, the designers preferring to number each section as if it were a book in its own right – allowing for flexibility in choosing which sections to download and print. The overall feel of the design is one of an academic or governmental report, complete with flow diagrams and pixelated reference images grabbed from the internet. 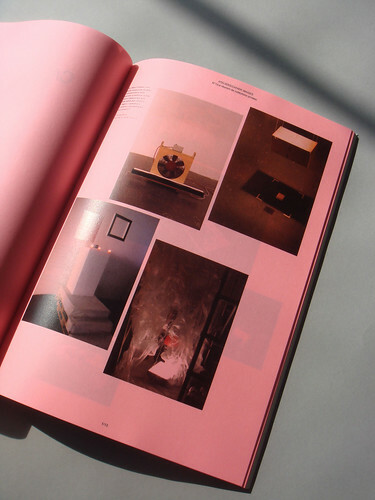 Elevated from the word-composed PhD thesis by the systemised yet sculptural typography, delicate binding and the informed use of materials – such as the fluorescent stocks – in a nicely overstated way. The book provides an antidote to the plethora of slicked-up, content-lite illustrated publications that dominate the shelves of art and design bookshops. It is raw, un-glossy, unapologetic, a beautifully laid-out reflection of the content, the quality and depth of which means the designers are not forced to revert to superfluous, expensive processes. One could argue that printing only one side of the sheet is perhaps, in these times of abject resourcefulness, a little wasteful but that would be missing the point. There are no overly optimistic print-runs, no make-ready sheets, no wastage when collated or bound, no transportation, and no pulping of unsold copies. 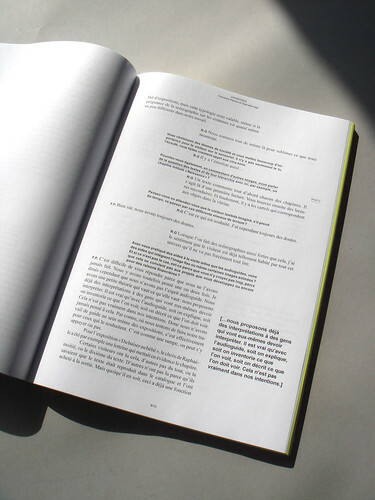 The content is delivered digitally and the user is left to decide how, or indeed whether, the book should be printed. The modest production, Web-based distribution and the strangely pumped-up visual language of academia are what make this book special. Now I have lived with the book for a while, I find that the fluorescent image sections are a little too souped-up, leaving an uncomfortable imprint on my retina. But, hey, if I don’t like it I could always do it differently myself. Sean Murphy is a founding partner of Value and Service.